· WE follow him because we believe in him and will continue to do so. · WE now love him more and more with every single wrong doing the others try to commit against him and our love will continue to grow, not only that, but Islam will also keep growing and that is a FACT, mind me! · Those who mock him and say this is their right to free speech.. well alright then, if free speech means to be vile, then so be it, enjoy your so called “VILE “ freedom of speech. Strange it is how those people people claim to be civilized!! Does being civilized mean to be so offensive? Finally, To us, Prophet Mohammad means A LOT. His body may be dead, but he continues to live within each Moslem. 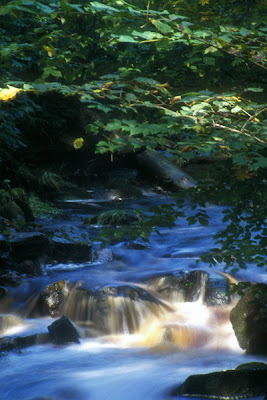 He is like the river, flowing to shed beauty and life within our hearts. He is our mentor after Allah and by Allah’s guidance. We love him because Allah loves him as all other prophets. Nothing will shake our love for him. Allahoma Saly wa salem 3ala khatam al anbya2, Mohammad Ibn Abd-Illah wa salem - May Allah pray and grant peace to the final Prophet, Prophet Mohammad. Alsalamo alikom, yes i am back, It had been a long while. I missed my blog and missed every one although i know many of the bloggers i knew have vanished, stopped blogging that is. But anyway, I am open to visitors and new friends. When will one ever recognize the difference between sinning and erring.. Sinning is what leads to errs…. There has to be an order for things, and this is I believe the correct way to order them. A man who is married to a non Moslem who happens to have fought for his commitment to this woman is now beating her! Moreover he is with another woman! Not only that, he has two lovely children caught up in the middle of this mud-pool of a deteriorating marriage. I tried by all means to fix this but unfortunately he is not who I thought he was. I found out I was dealing with an irrational person. A person who has given up all aspects of being an Arab, and worst of all of all the good traits a Moslem man should embrace and apply to daily life. A true Moslem would not inflict harm on others, imagine inflicting harm on the mother of his children. She admitted the fault was hers and that she had a great role in the deterioration of their marriage, but she begged for a one last chance to better things. Every one is entitled for a chance. We commit the worst of sins and Allah the almighty told us there is always a way back, a way to repent and for this repentance to be welcomed and accepted by Him. Why can’t human beings learn to forgive, specially when there is so much at stake?! I in turn spoke to him and tried, I also ended up begging him to give her one final chance. I said everything that should make the metal melt, but alas, he did not want to even try, not even for his little loved ones. NO! Not for any human being were his words! And all this why? Because he has the “Alternative”, another woman who has accepted to be with him, both blinded by what they unfortunately think is the real happiness and love they did not have. Another wrong beginning with an adulterous man who does not even feel ashamed of what he has done. He should be in shame when he addresses his wife for God’s sake, but no, he has the guts to even lay hands on her and even call her names and curses and swears! God’s wrath shall befall him and his mistress anyway, if not in this life in the next, that is needless to say. Maybe now they are happy but they in turn will end where he ended with his current wife. That was the same beginning he began in with his first wife and look where it lead them. Not that it ended, there are still so many offences and problems. The children are now suffering and that is what kills me most. Maybe if he had repented, both he and his wife, they would not have ended where they are now. But this is the result of abandoning God’s commandments, whether it is in Islam or Christianity in this case. It is so strange how some men choose not to learn from previous mistakes…In this case the offence is to all Moslems. Islam is a decent religion, only some of its followers are giving it a bad name. But does this mean Islam is to be blamed? Does this mean that all Moslems are bad? Any one with a right mind would say no. Generalizations cannot and should not take place in situations like this, but the case and the matter is Islam is blamed anyway. Just like terrorism, if one person who is an arab and Moslem does something, all Moslems and the whole religion of Islam is blamed. What about the Mafia? What religion do they follow? Don’t most of them wear crosses and maybe some are Jews? Does this mean that All Christians and Jews are bad? Well if you ask me, no not all Christians and Jews are bad. I really do not understand, why does this only happen with Islam and its followers? Why when a Moslem woman or girl wear a veil it is a problem, yet nuns who dress very similar to a Moslem veiled woman is not blamed or condemned by Western societies. It is a subject that leaves me puzzled. i'm so sorry for all you have being through dear! i do agree with you, religion itself doesn't make a person better or worse for sure! and i hope from the bottom of my heart that you are not the main character of that story! if you wanna talk, email me! it will be a pleasure to talk to you! take care! Thank you my dearest Leandra.. Oh no God no, I am not the main character, I only played the role of the one who was hoping to fix as i mentioned in the post.. Thank God I have a loving husband and i do my best to care for my home and family... I wish more people would think like u Leandra, the world would have been at peace! but what can i say? how many pple use ration? Very few i figure! i'm so glad and relieved, dalulla! thank you for your kind words my friend! again, if you need anything or just feel like chatting, please don't hesitate to contact me! Thank you my dear leandra, only stay in touch and I pray u always be happy and in good health! Welcome back ! Thanks free soul... I miss blogging so much and i miss all of you.. too bad many pple abandoned their blogs!